This one-page tool uses the colors of a stoplight to guide patients in managing some of their chronic conditions. 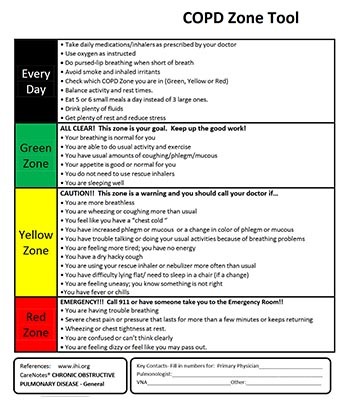 The tool is divided into green (“all clear”), yellow (“caution”), and red (“medical alert”) zones. For each zone, the tool provides signs and symptoms and allows the health care provider to give specific instructions for managing the condition, including guidance on when to seek emergency medical assistance. Click any link to open that PDF in a new tab.